We continue to hear news reports of mass shootings, of terroristic activities, of accidents or other events in which innocent lives have been lost, or people have been injured, and so on. Whether we know anyone involved in the situation or not, the very thought of it can be upsetting and disturbing. Older people have faced many tragedies in their lifetimes, including living through the Great Depression, experiencing the horrors of Pearl Harbor and World War II, and worrying about their families during the Korean and Vietnam wars. For some elderly people, in addition to the physical and emotional losses that accompany old age, the current crises may seem overwhelming, which leads to possible depression and other physical and emotional complications. Be a good listener and encourage them to talk about their feelings. Talking about feelings assists with the healing process—whatever that me be—and promotes a sense of wellness. Be careful not to be dismissive of your loved one’s fears and anxieties, but instead be open and honest about the emotions they’re feeling. Encourage them to talk about past memories of distress and loss. Sometimes people need to talk about memories and the past in order to understand or try making sense of the present. Perhaps focusing on how they overcame past difficulties and adversities can help them regain a sense of safety, security and well-being in light of today’s circumstances. Even journaling might help. Help them arrange to spend more time with family members, family pets, and friends. This can even include things like doing an art project with a grandchild, attending a grandchild’s concert at school, having a family night with dinner and perhaps a board game, or working together in a family garden. Suggest turning off the TV or radio so they can get a break from ongoing news coverage about whatever events have taken place, or just bad/sad news, in general. Instead, spend the time focusing on normal, day-to-day activities to regain a sense of normalcy and balance. Even participating in a relaxation technique like listening to music or walking through a park or on a nature trail can help. Suggest they seek spiritual counseling, if need be. 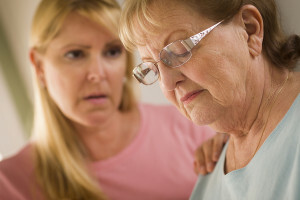 Speaking with a member of the clergy or spiritual adviser about current tragedies can often be therapeutic and provide comfort and solace for the aged. Perhaps your loved one would like to feel like they’re making a direct difference in light of the tragedy by doing something like giving blood, participating in a prayer vigil, raising funds for victims, or doing something nice for fire, police and other emergency personnel involved in the situation. Watch for signs of depression—not just the blues—and recommend they see their doctor if they’re truly depressed, begin withdrawing from daily activities, lose their appetite, or have trouble sleeping. If you or an aging loved one are considering home care in Ardmore, PA, please contact the caring staff at Alpine Home Care. In PA call 888-743-0068 . In NJ call (855) 410-1404. Could Public Transportation Help Your Parent Enjoy a Healthier, More Active Lifestyle? Your organization did a fine job providing services to my Dad. I was impressed particularly by the supervisor who took extra time to orient the change of shifts for the nurses providing one-on-one care. She also responded quickly several times to a need for one-on-one care for him on very short notice. The service was above and beyond. © Copyright . Site designed and maintained by Syndicate.